A normally-aspirated 6-cylinder engine making 300 horsepower deserves some praise. Until recently, 300-horsepower required a V8 or some form of forced-induction. Today, technology allows more horsepower-per-liter than ever before. Unfortunately, a well-tuned engine from the factory means that the aftermarket may struggle to find any additional horsepower. As the Hyundai Genesis Coupe enters its second production year, aftermarket performance manufacturers are making noteworthy progress on research and development for both the 2.0T and 3.8-liter V6 platforms. Since we’ve already modified a 2.0T, it was only natural to see what the performance basics would deliver on the V6 Coupe. Getting more air into the engine is the key to increasing power output. By installing a performance intake system, a higher percentage of the cylinder can be filled on each intake stroke. 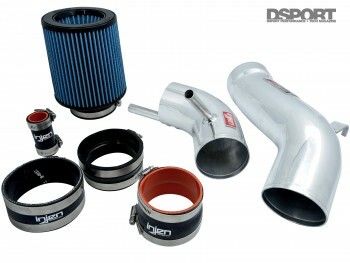 For our Hyundai Genesis Coupe 3.8, we selected a cold-air intake system from Injen Technology. Cold-air intake systems are designed to supply cool air from outside the engine compartment to throttle body. The lower temperature air provides two benefits. First, the cooler air reduces intake air temps. This lowers the chance of detonation. Second, additional power can be realized as the lower temperature air charge has a higher density. This higher density translates into a higher mass of oxygen molecules for a given volume of air. Injen’s Cold-air intake system includes a low-restriction cone filter and larger- diameter tubing. The system also includes a replacement windshield washer fluid container that provides room for the tract piping to reach far down behind the front bumper. While a well-designed intake air filter system allows an engine to ingest more air in the cylinders, a performance exhaust system allows an engine to use less effort (horsepower) to expel spent gasses. Injen Technology’s cat-back exhaust system features an X-chamber mid section that outlets to independent right and left high-flow piping. 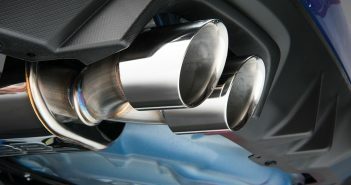 The exhaust outlet splits to two tips per side and the burnt-blue finish sets off an aggressive appearance. 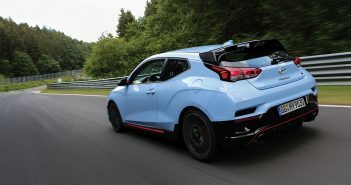 The systems larger-diameter, mandrel-bent piping and high-flow muffler free up horsepower choked off by the factory exhaust system. 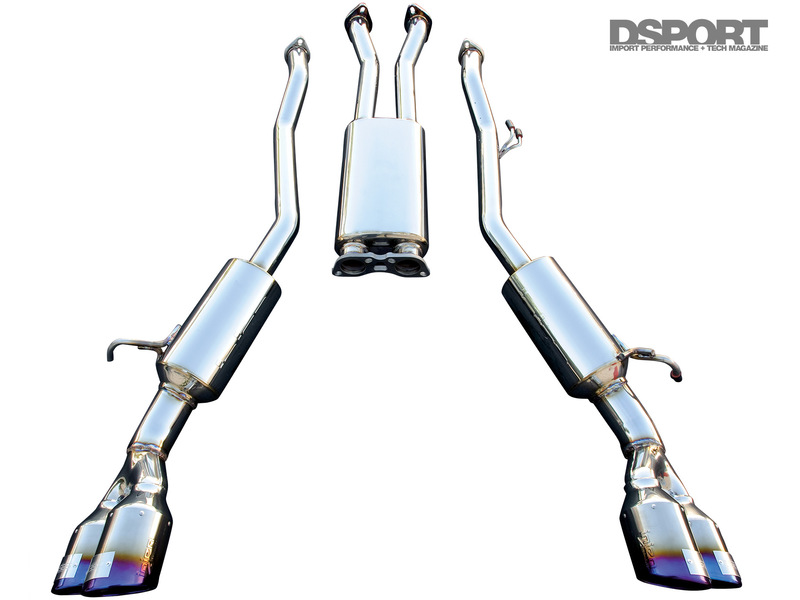 To further aid in easing exhaust flow, removal of the factory catalytic converters eliminates the biggest restrictions in the exhaust tract. While this modification is not legal for vehicles operating on public streets, it is a popular means for more power on track-going cars. 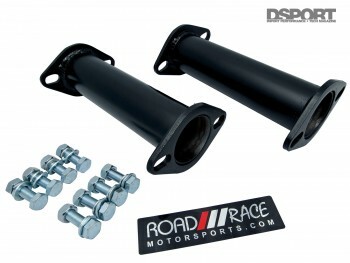 We sourced a pair of Road Race Motorsports cat-delete pipes to replace the factory catalysts. 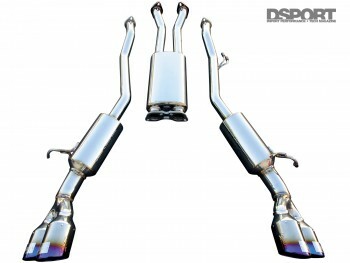 The pipes are designed as direct bolt-in replacements that can bolt in between the stock header and cat-back piping.